Turn on the TV, open the paper or log on to the Internet. The event, itself, is unprecedented. The devastation, unimaginable. It's times like this when we see ordinary people do extraordinary things. Over the past two weeks, we've watched neighbors helping neighbors and strangers helping strangers. Heroes, every one. Acts of bravery, selflessness and kindness abound. And the generosity! After just 12 days (as of this writing), individuals and businesses have donated more than $150 million to Hurricane Harvey relief efforts. Before Harvey hit, many nonprofits were in the midst of planning their year-end fundraising campaigns. Many count on their year-end campaign to provide a significant boost to their organization's annual revenues. Are you one of those nonprofits? Are you worried that you might lose donors this year because they're giving to the relief efforts? Or maybe you serve South Texas and Louisiana, and you're concerned because you're not a relief organization. What will happen, you wonder. What will your donors do? 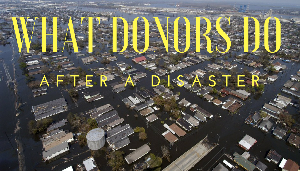 When you consider the timing of the hurricane, its catastrophic nature, and the tens of millions of dollars that have already been donated by individuals, it's natural to think that donors may start to experience donor fatigue. That, by them time you send your year-end appeal in November or December, your donors will feel overasked - even overcommitted. Do you fear that donors will be less likely to respond to your appeal? Or that they'll be less generous than in years past? Here's some good news. The data suggests otherwise. "People tend to react to disasters with small gifts, and don't dramatically change their budgets. In studies on giving in response to the September 11, 2001 attacks, to the tsunami in Southeast Asia [in 2004] and to Hurricane Katrina [in 2005], the average gift was between $125 and $135. The median gift - perhaps a better measure of what is typical - was $50." In fact, if you look at historical giving data, overall giving actually increases in the years where there is a large national or international disaster. Look at three recent examples. In 2005 (Hurricane Katrina), 2010 (Haiti earthquake) and 2012 (Superstorm Sandy), charitable giving in the U.S. greatly exceeded the previous year's giving. This suggests that donors give over and above, after a disaster. They don't reduce their annual household giving, and they don't stop giving to other organizations simply because they choose to give to relief organizations in a particular year. That said, it's important to understand people's motivations for giving. The very word "philanthropy" means "love of humanity." In The Fundraiser's Measuring Stick, Jerry Panas explains that "Donors want to know why they should give. And especially why they should give now." After a disaster, there's a clear and urgent need. What about you? Can you demonstrate a clear need? (Tip: People don't give because your organization has needs. They give because you fill a need - because your organization offers a solution to a problem.) Consider your clients' needs. Your community's needs. Why are those needs urgent? Remind the donor that the problem can be solved. Then invite them to be part of the solution, by making a financial gift. WHY DO PEOPLE KEEP GIVING? Ask yourself, do you make your donors feel good about their decision to give to you? Do you thank them well? Is your thank you prompt and personal? Does it tell them exactly how their donation will be used? Do you follow up again, after the gift, and tell your donors the impact of their gifts? If you can answer yes to these questions, your donors will want to continue to support you. And, in all likelihood, they will. Jerry Panas offers a simple maxim: "Givers give." People will give to relief organizations after a disaster. They'll also continue to support the other causes they care about. Including yours. My prediction? This is the year we'll see U.S. charitable giving (private philanthropy) exceed $400 billion. For the first time ever. I believe Harvey will bump up the overall giving totals for 2017. However, your nonprofit shouldn't expect reduced giving from your donor base this year, provided you've been doing good work and stewarding your donors well, all year long. Need help writing a winning fundraising appeal or creating a donor stewardship plan? Laura Rhodes can help.